Christianus Bale, qui partes Batman egit. 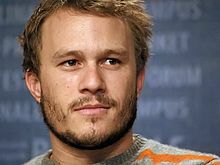 Heath Ledger, qui partes The Joker egit. The Dark Knight est pellicula a Christophoro Nolan ducta, anno 2008 edita, quae posita est in Batman heroe DC Comics societatis librorum nubeculatorum. Est secunda e tribus Batman pelliculis a Nolan ductis — prima fuit Batman Begins anno 2005 edita, tertia autem The Dark Knight Rises anno 2012 edita. The Dark Knight fuit prima Batman pellicula, cuius in titulo nomen Batman non videtur. Heatcliff Ledger, partium The Joker, sceleris insani actor — quibus partibus multum laudatus est — Ianuario 2008 annorum 27 aetate mortuus est septem menses ante pelliculam editam. Et Golden Globe praemium et Academiae praemium postuma ob opus histrionale ei data sunt. Nolan, moderator cinematographicus, pelliculam memoriae eius dedicavit. Novissima mutatio die 31 Decembris 2018 hora 17:20 facta.